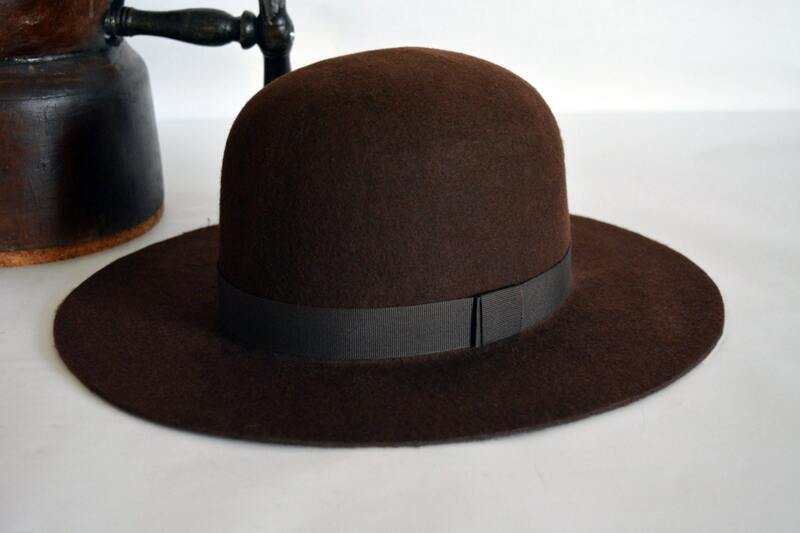 Round Crown Fedora | Styled and finished entirely by hand. Have something made just for you! You are welcome to enter your color customization preferences at checkout or contact us for a custom commission. Do you wish to receive your hat sooner? Shipping upgrades will be available in your cart! - Please forget about hat sizes. Heads do not come in sizes. - Find your measuring tape. A non-stretchy string will do, too. If you use a non-stretchy string, wrap it gently around your head in the same manner. After you have marked the exact circumference, lie the string down on a flat surface and measure it with a flat ruler. Even a drop of water on a hat that has collected dust can leave a spot. Be sure to brush your hat before leaving home with a horsehair hat brush. Sizes, brims and crowns should be within 1/8 of an inch of the requested measurement, plus or minus. Due to monitor differences, actual colors may slightly vary from what appears online. To fulfill your order, you must provide us with information (which you authorized Etsy to provide to us), such as your name, email address, postal address, payment information, and the details of the product that you’re ordering. You may also choose to provide us with additional personal information (for a custom order, for example) if you contact us directly. We may store and process your information through third-party hosting services in the US and other jurisdictions. As a result, we may transfer your personal information to an authority with different data protection and government surveillance laws than your authority. If we are deemed to transfer information about you outside of the EU, we rely on Privacy Shield as the legal basis for the transfer, as Google Cloud is Privacy Shield certified. Access. You may have the right to access and receive a copy of the personal information we keep about you by contacting us using the contact information below. Object. You can object to (i) our processing of some of your information based on our legitimate interests and (ii) receiving marketing messages from us after providing your express consent for receiving them. In such cases, we will delete your personal information unless we have compelling and legitimate grounds to continue using that information or if it is needed for legal reasons. Complain. If you reside in the EU and wish to raise a concern about or use of your information (and without prejudice to any other rights you may have), you have the right to do so with your local data protection authority. For purposes of EU data protection law, I, Panos Skantzaris, am the data controller of your personal information. If you have any questions or concerns, you may contact me at hnc-hatworks [!at] post.com. Can I have something custom made for me? Custom and personalized orders is our core business. We always enjoy assisting you in finding the style, proportions, and details that best suit your physical features, wardrobe, and lifestyle. All you need to do is, please ask. We will do our best to respond to your message within the next 48 hours. How long would it take you to make my hat? We still use the same vintage wooden hat blocks and employ the same hat making techniques for 85 years now. It usually takes us around 2-3 weeks to finish and ship one of our handmade hats. There are over 20 different steps in the making of your Agnoulita, and unfortunately, we cannot rush this very old process. How long will it take to get my hat? Most of the times we are happily overwhelmed with orders ahead of yours. Once we complete and ship your hat it usually takes no more than 10-20 working days to deliver in most parts of the world depending on the shipping package you have selected. Shipping upgrades, with speedier delivery times, are available in your cart. How can you make sure my hat will fit perfectly? I am afraid that would be entirely up to you. Heads do not come in hat sizes. You will need to forget about sizes and that little tag in your favorite hat. Even if it reads a US 7½ we will still have no idea about your exact head size. The best and most efficient way to get a great fitting hat from us is to measure your head. Measure. Measure twice and we will custom size your hat to your measurement. Can I just measure the inside of another hat and get on with my order? No, that never works. Measuring the inner circumference of a hat without a measuring ring, an instrument used to measure the inside diameter of a hat in order to determine its finished size, is impossible. Even if your hat has the perfect fit, your measuring tape will always get 1.50 to 2 centimeters a smaller size from your actual head size. You really need to measure your head before ordering. How do I measure my head? To determine your head measurement, you can use either a tape measure or a non-stretchy string. Place the tape on your forehead, where you wish your hat to rest and pass it around your head. If you use a string, you need to make sure it does not stretch. Wrap it gently around your head in the same manner. After you have marked the exact circumference, lie the string down on a flat surface and measure the length with a flat ruler. I am ready to order but... what is a sweatband? The sweatband is the material we place inside where your forehead touches your hat. It serves as a layer of protection and comfort between the felt or straw hat body and your skin. Selecting a genuine leather sweatband over a faux leather one is just a matter of personal comfort and preference. Most of our customers prefer real leather sweatbands since this the only part of the hat they can feel when wearing it. Although the difference in appearance is evident only to experienced hat wearers, a good leather sweatband will better keep the oil and perspiration in your skin and hair from damaging the hat. How can I take care of my hat? Here are some basics for keeping your Agnoulita in a good condition for years. - keep your hat in a cool, dry place. - store it in a hat box if available to protect it from dust. - place your hat on its crown, when resting. - pick it up by the underside of both the front and back brim. - pick your hat up by the head or the pinch. will potentially be an issue. 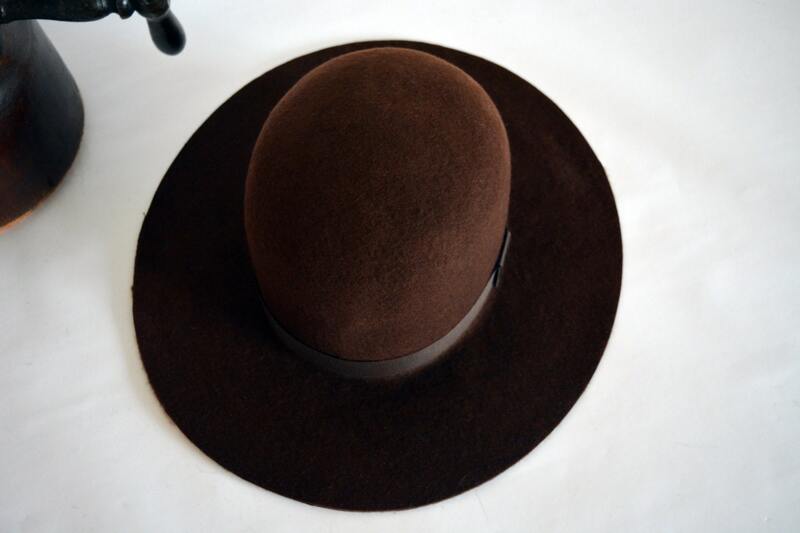 - let your hat be in the sun for extended periods of time to avoid discolorations. How can I keep my felt hat clean? Felt hats require regular brushing, especially before leaving home or exposing them to moisture. Even a drop of water on a hat that has collected dust can leave its mark. Clean off dust and dirt using the steam from a kettle and a soft bristle hat brush. If a hat brush is not available, please make sure the bristles of your brush are not too stiff or harsh on the felt. Always brush counterclockwise as felt tips always face this direction. Remove any marks using spirits such as lighter fuel or dry cleaning fluid in a well-ventilated room. 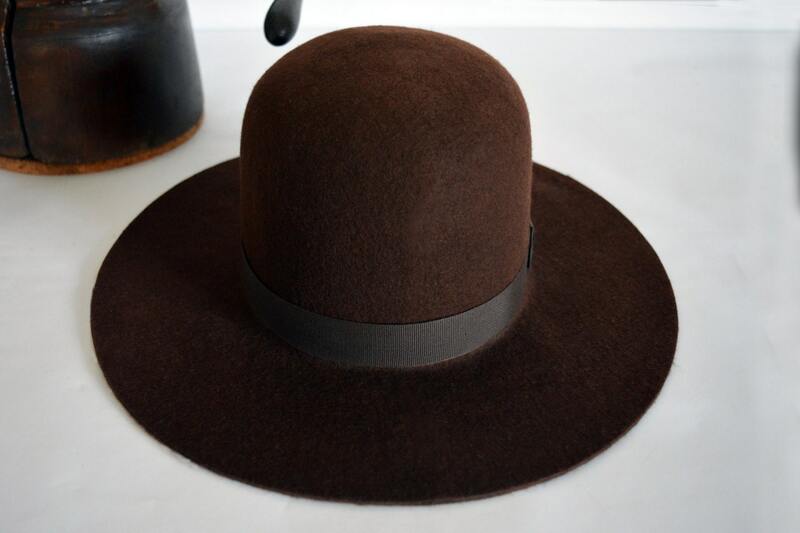 Test first by applying the cleaner to a small area of the hat which is not visible. Dry with a clean absorbent cloth and leave at room temperature. How do I flatten my hat's brim? 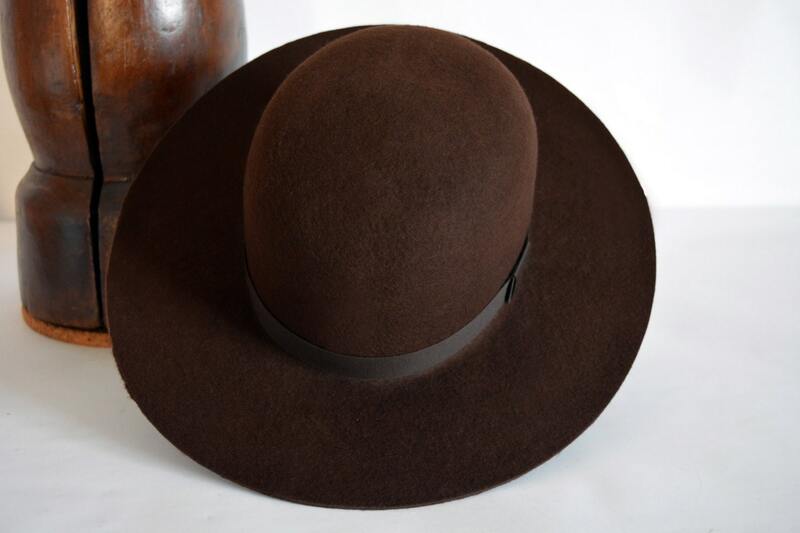 To flatten out your hat's brim, you will need to rest it on a flat surface with the top part of the brim face-up. Take a piece of a light colored cotton cloth and dampen it. Make sure it is not soaked wet, a little moisture will do the job. Place the cloth on the brim and set your iron to high heat and run it across the rim. Press down on the iron, exerting moderate pressure to help flatten the edge. Continue in this manner until the brim is completely flat. Allow it to dry and stiffen well. Of course, you may repeat this process from time to time to freshen up your hat. However, please make sure you always use a piece of cloth between the felt and the plate of your steam iron. I love it! This has was brilliantly put together, and the customer service was exceptional.